Highlights of the Oklahoma Transportation Commission's Dec. 7, meeting include details on a long-awaited federal transportation bill, recognition of an innovative Oklahoma Department of Transportation bridge project, presentation of the updated County Improvement for Roads and Bridges plan and approval of funding for major railroad crossing improvements in Chickasha. Commissioners also awarded contracts for major interstate work in the Oklahoma City metro area and on I-35 as well as resurfacing almost 6 mi. (9.7 km) of SH-3 in McCurtain County. Executive Director Mike Patterson noted the much-anticipated passage of a long-term federal transportation bill, the Fixing America's Surface Transportation Act, which was passed by Congress and signed into law by President Obama on Dec. 4. The FAST Act provides five years of federal funding and important policy reforms, which are crucial to ODOT's ability to deliver the projects in the eight-year Construction Work Plan. Patterson thanked the members of Oklahoma's congressional delegation, especially U.S. Sen. James Inhofe, who chairs the Senate Environment and Public Works Committee, and U.S. Rep. Markwayne Mullin, who was a member of the conference committee that negotiated the final legislation. 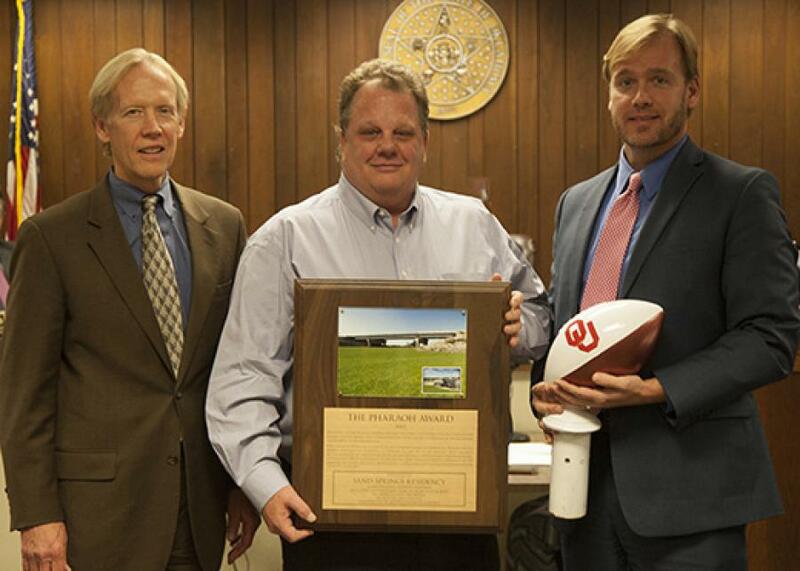 The Association of Oklahoma General Contractors honored an innovative ODOT project with the Pharaoh Award, which recognizes the best bridge construction in the state. The award recognized the replacement of the SH-51 bridge over Cottonwood Creek near Mannford in Creek County, which was completed in late 2014. Using accelerated bridge construction techniques, ODOT's contractor was able to construct the new bridge alongside the existing structure while the highway remained open to traffic. The old bridge was then removed and the new bridge slid into place, resulting in a highway closure of only 11 days rather than the six months required using conventional construction methods. The County Improvement for Roads and Bridges' plan for state fiscal years 2016-2020 was approved by the commission. The $916 million plan includes projects to address 439 county bridges and 875 mi. (1,408 km) of local roads using designated federal and state funds combined with matching funds from the counties. Each year, ODOT works with county commissioners and their Circuit Engineering Districts to identify the highest priority county road and bridge projects for inclusion in the CIRB plan. Commissioners awarded several contracts to improve busy highways in the Oklahoma City metro area, including a contract with a $4.6 million base bid and possible financial incentives to rehabilitate nearly 7 mi. (11 km) of I-40 in eastern Oklahoma County and install several highway message boards on I-40 and I-240 in the area. They also awarded a nearly $9 million contract to resurface portions of I-40 and I-240 near Tinker Air Force Base and a $1.4 million contract for bridge rehabilitation on SH-66 (N.W. 39th Expressway) at the I-44 junction. The commission approved contracts for three I-35 projects totaling $22.6 million, including bridge replacement near Pauls Valley in Garvin County and near Blackwell in Kay County and resurfacing of 16 mi. (25.7 km) of interstate near Guthrie in Logan County. Also awarded was a $14.7 million contract for highway and bridge reconstruction on SH-3 near Broken Bow in McCurtain County and a $5.3 million contract for street and bridge reconstruction in partnership with the city of Stillwater using federal and local funds. Additionally, funding was approved for three railroad crossing projects, including improvements to a rail corridor in Chickasha that will add new signals and gate arms at eight locations and close three at-grade crossings. In all, commissioners awarded 45 contracts totaling nearly $115 million to improve bridges, highways, interstates and roads in 35 counties. Contracts were awarded for projects in Adair, Atoka, Beaver, Blaine, Bryan, Caddo, Canadian, Carter, Choctaw, Craig, Creek, Custer, Garfield, Garvin, Grant, Greer, Jackson, Jefferson, Kay, Kiowa, Logan, McClain, McCurtain, McIntosh, Muskogee, Nowata, Oklahoma, Ottawa, Payne, Pittsburg, Pushmataha, Rogers, Seminole, Sequoyah and Wagoner counties. The eight-member panel, appointed by the governor to oversee the state's transportation development, awards project contracts for road and bridge construction every month.